Our experts will answer your questions regarding site administration, product registration, service request management, and much more! Our experts will also provide guidance on how to stay informed about new and improved capabilities as they are introduced. Ryan was born and raised in central Massachusetts, and has been with EMC for 5+ years. His primary focus is working with customers to identify ways we can improve EMC's online experience, then translating the feedback into a solution that meets their needs. Brant has 14 years professional experience in Project/Program Management and/or Call Center Management in the Insurance and Technology industries. He is our EMC Online Support Service Center expert. Donny specializes Project and Content Management. He has been the Publishing Manager for EMC Online Support Content for almost 5 years. Suzanne has been with EMC for over 15 years. She is our Online Chat expert. This discussion takes place from August 31th - September 25th. Get ready by bookmarking this page or signing up for e-mail notifications. This Ask the Expert session is now open for questions. For the next couple of weeks our Subject Matter Experts will be around to reply to your questions, comments or inquiries about our topic. Let’s make this conversation useful, respectful and entertaining for all. Enjoy! 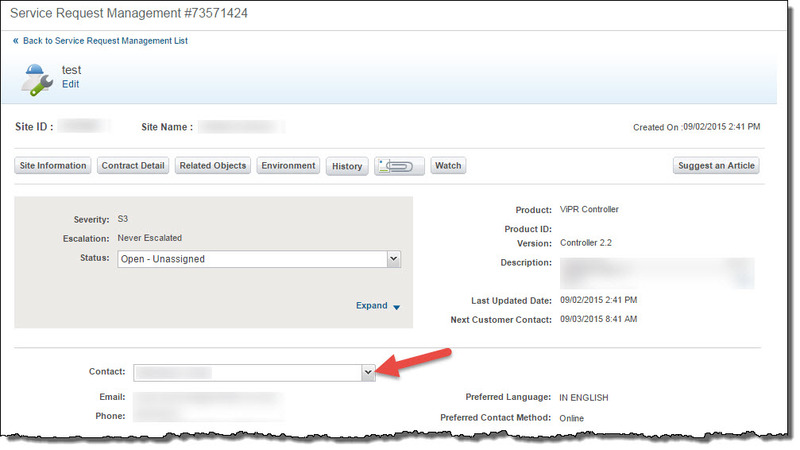 Customer Atos is asking when and how EMC support is using the alternate contact in a Service Request. Is there a general rule support resources are reaching out to customers? When a customer open a Service Request in Online Support, any alternate contact phone number or email address that a customer has assigned via their Online Support Preferences>My Settings will be displayed in the Create Service Request form. Before a customer submits a service request, they have the option to modify the alternate contact information for that particular service request (or leave it as is). Once a customer submits a service request, any alternate email address or phone number information that was populated in the Create SR form,is appended to the note on the Service Request. EMC Technical Support Engineers would see this alternative contact information in the notes when reviewing the Service Request. When a Service Request is opened in Online Support, the customer who opens the Service Request is listed as the contact on the Service Request. Open the Service Request that you wish to reassign to another contact by clicking on the SR Number in the list view. I hope this answers your question. If it does not, please reply to this post to let me know if you have further questions. 01. Is there any plan to integrate EMC Support with EMC tools like ESRS, EMC unisphere central so customer can see the SR rather than logging a manual . 02. Will there by anyway to change the severity of the automatic logged cases ( Through dial home/call home) since sometime the case need more attention but its impossible to change the severity so I had log a manual case for the same issue with the high priority . 03. Why its not possible to upload multiple attachment to EMC SR at the same time. 04. Why its not possible to see the update on the case when its get dispatched to the field . Thank you for taking the time to submit questions to our team. We have responded to your questions below. Please let us know if you have any follow up questions! 01. Is there any plan to integrate EMC Support with EMC tools like ESRS, EMC unisphere central so customer can see the SR rather than logging a manual.This is great input, and is something we have had initial discussions on, and we are actively working on trying to ensure a seamless experience between the console and EMC support information. We value your input. 02. Will there by anyway to change the severity of the automatic logged cases ( Through dial home/call home) since sometime the case need more attention but its impossible to change the severity so I had log a manual case for the same issue with the high priority . Currently we do not have a way of changing severity on the automated logged cases, however we recommend that if a severity needs to be changed on the SR that our customers request a severity change by communicating with the support engineer, either by calling into EMC support, or directly from the service request by adding a note. 03. Why its not possible to upload multiple attachment to EMC SR at the same time.Currently, to ensure customers have optimal performance when uploading attachments to Service Requests we limit the upload function to one attachment at a time, as uploading multiple attachments may result in performance issues depending on the size and number of attachments that need to be uploaded. EMC is currently in the midst of upgrading the supporting system infrastructure for attachments, which will enable us to deliver performance and usability enhancements to our current capabilities, such as enabling multiple attachments to be uploaded simultaneously and enabling attachments of unlimited file size. At this point, the ETA for the delivery of these particular enhancements is Q4 2015, while the immediate focus is on upgrading the infrastructure. 04. Why its not possible to see the update on the case when its get dispatched to the field. This is a great idea, and it is also a capability that we have on our road map to implement as we understand that providing customer/partner visibility to the field support activities will improve the Online Support experience. At this time, we do not have an ETA for when the visibility to field support activity on service requests will be delivered, but it is on our radar. Thanks a lot for your answer . May be its good idea to create group of users as an forum or pilot who can work together with EMC support directly and improve the EMC support . We have almost 1000 devices and monthly SR per month is around 125 so if you have plan to make such kind of user experience group or pilot group please add me in , I will be happy to be part of it . Yes we do have a group we work with to provide feedback on our support structure and site. We are also consistently reaching out to customers to pilot our features so we will definitely keep you in mind. Thank you for volunteering your time. Thanks a lot , hope the things will be better and improved !!! As a SE I have access to the support.emc.com site and can see customer SRs etc. It would be great if the account managers I work with could also have access. So that we can both be alerted to any sev 1 they raise. How does the account manager get access to the system?